Groundwater is a dwindling resource that is relied upon around the world. Unfortunately, industrial activities have deteriorated groundwater quality to the extent that the resource is not fit for consumption and is harmful to ecological receptors at many locations. 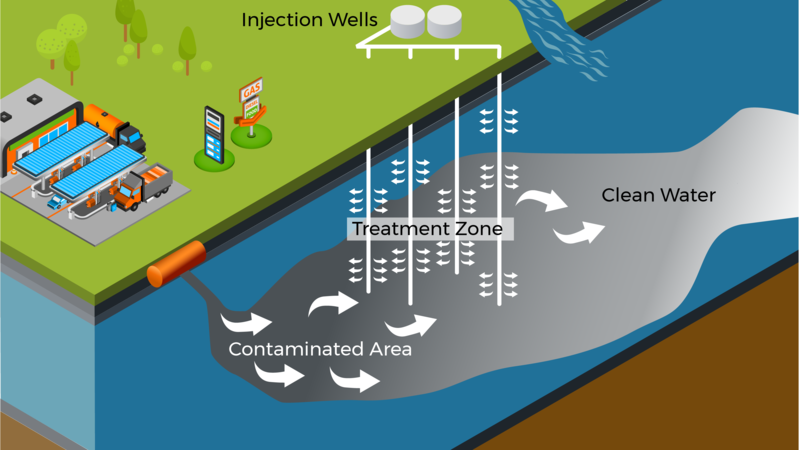 Nearly all groundwater contamination can be treated. However, at many sites confounding conditions related to the nature of the contaminants, the geologic setting, and the dynamics of treatment escalates costs to prohibitive levels. Beginning in 2015, experts from WSP USA joined the U.S. Environmental Protection Agency (EPA) and National Ground Water Association (NGWA) initiative to promote more efficient groundwater treatment by combining multiple technologies in which each technology works within its most efficient design window. WSP’s experts went further and provided additional significant cost saving on combined remedies by advocating for the use of multi-component amendment formulations that stimulate multiple in situ degradation pathways with a single application. Traditional combined remedies, often referred to as treatment trains, optimize groundwater remediation either by simultaneous or sequential treatment processes. Ideally, each discrete process efficiently couples unique temporal or spatial site conditions to the most applicable technology under those conditions. This concept recognizes and allows for planning around predictable changes in conditions to maintain optimal treatment efficiency throughout the remediation project. Efficiencies gained by combining remedies provides incremental cost savings that lowers the cost barrier to groundwater cleanup. WSP’s approach lowers the cost barrier to treatment even further by engineering chemistries that are combined into a single formulation and application. Recent examples of WSP’s innovative take on combined remedy projects are highlighted below. WSP successfully treated dissolved chlorinated solvents in fractured bedrock groundwater at the site of a former electronics manufacturing facility in Pennsylvania using an in situ combined remedy of engineered biogeochemical reduction and bioremediation. This first-of-its-kind technology replaces traditional groundwater cleanup technologies, such as pump and treat, at sites where historic mitigation alternatives were limited to plume management. We have promising initial results at two additional sites in Missouri and Arkansas. The project received the 2016 Technology Merit: Remediation Award from the Environmental Business Journal. WSP recently completed a large-scale pilot test of a combined remedy consisting of in situ application of activated carbon, biostimulants and attenuating microbes at a fractured sandstone site. The amendment formulation was designed to manage back diffusion of dissolved chlorinated solvents from the sandstone. Innovative in situ microcosms were used to demonstrate contaminant destruction and provide information needed by regulators to approve the innovative technique in place of the much more costly presumptive remedy, a long-term pump and treat system. WSP performed a recent direct chemical oxidation and bioremediation combined remedy treatment to address dissolved petroleum constituents, including benzene. The treatment was highly effective and quantified the rate of bioremediation using DNA-based diagnostics. This information will be used at other areas of the facility to further optimize the amendment formulation balance between more expensive chemical oxidants and less expensive biostimulants. For additional information on combined remedies, please refer to the recent article by these authors: Thinking Outside the Boxcar: Effective & Sustainable Combined Remedies Using Single Application of Multi-Functional Amendments featured in the January 2017 edition of Groundwater Monitoring & Remediation. Demo is an environmental engineer with five years of professional experience focused on contaminated site investigation and remediation. His area of focus includes enhanced in situ bioremediation systems, water and wastewater treatment, and soil and groundwater monitoring and treatment. As an associate consultant, Demo has extensive experience in construction oversight and the design and implementation phase of numerous remedial technologies including, but not limited to, excavations, vapor mitigation systems, dual-phase extractions and evaluating monitored natural attenuation.